Is it really such awful work to be a billionaire hedge fund manager? And why are they having such a hard time this year? Just last week, Stanley Druckenmiller, who ran Duquesne Capital Management, a $12 billion fund, told investors that he was closing his firm and quitting after 30 years in the business. A few days later, Paolo Pellegrini, who ran the PSQR fund, believed to have under $1 billion in assets, announced that he was returning his investors money, though he said he wasn't closing the fund but would manage only his own capital. Both funds have suffered losses this year. Druckenmiller's fund is down about 5% -- after years of spectacular gains -- and Pellegrini's fund had lost about 11% so far. Druckenmiller, whose net worth is estimated at $2.8 billion by Forbes magazine, sounded contrite. "For me the disappointment of each interim drawdown over the years has taken a cumulative toll that I cannot continue to sustain," he wrote to his fund's investors. A drawdown is the loss measured quarter to quarter. Pellegrini was even more regretful. "I've concluded that substantial additional work is required to position the fund to profit consistently," he told his investors. A Paradigm Shift in the Hedge Fund Business? Despite the two bad performances, hedge funds on the whole aren't doing so badly this year. While they were down 19% in 2008, they were up 1.34% in the first seven months of the year, according to a weighted composite index by Hedge Fund Research Inc. That compares with a small decline in the S&P 500 stock index. But those results pale in comparison to the often spectacular returns hedge funds have notched up in recent years. 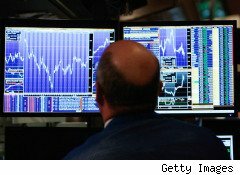 Hedge fund managers normally charge "2 and 20": 2% of the fund's assets as a management fee, and 20% of the profits they earn as a performance bonus. "There was an extraordinary growth in these markets over the last decade," says Terrence Martell, a professor of finance at the Zicklin School of Business at Baruch College, part of the City University of New York. "It isn't clear to me that all of the people who got involved in the business are going to survive, and this could be part of that shakeout process." Martell says that as a result of the global financial crisis, there's great uncertainty in most financial markets, including equities and commodities, two areas hedge funds often make bets on. "The real question is whether we are having a paradigm shift," Martell says. "Is there something structurally that is going on right now and the historical models need to be modified?" For example, a number of major hedge funds that normally take bets on currencies are now piling into gold investments. The Wall Street Journal reported last week that hedge fund stars like George Soros and John Paulson had taken huge positions in an exchange-traded fund that holds gold bullion. Soros has $600 million in the fund and Paulson has $4 billion, the newspaper said. Sebastian Mallaby, who has written a bestselling book about the hedge fund industry, More Money than God: Hedge Funds and the Making of a New Elite, said the industry went from about $2 trillion in assets at the start of 2008 to just over $1 trillion by the end of 2008, a huge decline caused by market losses and withdrawals of investments. But Mallaby says he thinks they will grow "massively" again because institutional investors such as pension funds and college endowments have come to realize that hedge funds offer investments that often aren't correlated to the stock market. When equities are way down, hedge funds often move in the other direction, balancing risk. Mallaby spent long periods with Druckenmiller in the reporting for his book, and says that the fund manager was obsessive about making profits. "He was addicted to watching his numbers: Was he up or was he down, and if he was down, he was incredibly depressed, and if he was up, he felt that was a high," Mallaby says. He quoted David Swenson, the manager of the Yale endowment, as saying the personality types of best hedge fund managers were a bit crazed. "Without it, you can't be that vigilant and that obsessive and compulsive, watching all the markets all the time, switching large amounts of money on a dime if you feel that things have changed," Mallaby says. 'Druckenmiller has that personality, but it's a pretty draining thing to do it over a long time." Druckenmiller famously made $1 billion when he worked for Soros' Quantum Fund when he bet against the British pound in 1992. He left Quantum in 2000 and took his family on a planned long vacation to Africa. But he was soon back at his own firm, Duquesne, obsessively running the numbers. According to Mallaby, the 57-year-old Druckenmiller speaks often about wanting to concentrate on his golf game and spend more time with his family, though his children have already reached adulthood. Mallaby says Druckenmiller was probably not affected, as some reports have suggested, by efforts in Congress to tax hedge fund managers at a higher rate: "He's worth more than $2 billion: If you took half his money away, it wouldn't make a difference to his life." He noted that Julian Robertson, who closed his Tiger Management hedge fund business after suffering big losses in the dot.com implosion of 2000, returned to the business by providing seed capital to 38 former protégés who run hedge funds of their own. Forbes says Robertson's wealth has grown from $400 million in 2003 to $2.2 billion last year. Martell believes most of the recent departures are due to bad market performance, not other factors. "If you sit and talk to some of these people and you ask them about fund performance, they realize that they are managing other people's money and it's not fun to have to call a customer and say 'You're down 6% for the month.' These are conversations most people don't like to have," he says.